First, make a wise decision on the kind of features of the flashlight that meets your needs at the campsite. In this case, consider the reliability and brightness first. Secondly, make a consideration of your ability to buy the flashlight. Remember, the more superior the features, the higher the cost of the device. Check your financial plan. What are the best features and functions of the flashlight? Once you are through with the decision pertaining your needs and budget, shift your attention to the flashlight features. As I have shared before, the more brightness and best features in a flashlight, the higher the cost. But, never shop a flashlight on the price factor. Buy reliable equipment rather than cheaper stuff. 1. The amount of light produced by the device. It is very vital to consider the intensity of light produced by the flashlight. The measurable unit of light potency is called lumens. For better outcome, establish the distance of the beam. Determine the furthest it can project before it diminishes in the brightness. We refer to this as beam distance. Secondly, mark the runtime. Calculate the duration taken by the light produced to drop to 10% of the output rating on the new batteries. In some cases, the intensity of light diminishes gradually over time. In another scenario, the output remains at a flat rate and then decreases suddenly. 2. The type of the battery and its runtime. Flashlight batteries differ both in type and quality. Consider if the battery is readily available. Popular battery sizes include AAA and AA. You can quickly get these types in the market stalls. Some other rare battery types include D cell batteries and the CR123A type. The latter is much expensive and comprise of high voltage. Some battery types are recharged using AC or DC means. They have inbuilt lithium-ion batteries. They are indeed costly. Others are not rechargeable. Consider the flashlight’s controls. All ordinary flashlights have the ON/OFF control buttons and four types of modes that is: low, medium, high and boost. You have the choice to select the style that fits your need. The boost mode produces a high-intensity beam. The runtime will always be shorter if the pattern is brighter than dim. 3. The size and weight of the flashlight. People have a variety of choices on the size and weight of the flashlight. In most cases, large-sized flashlights that are heavier are not brighter, though, they may offer you extended services because of their battery capacity which is greater. 4. The material and shape of the flashlight. Aluminum: Aluminum is a good conductor of heat. It’s light, durable and most available. This stuff is considered much significant regarding performance, durability and resistant to corrosion. Titanium: In comparison to aluminum, titanium is heavier. It has different varieties of appearance, and it’s h3. Practically, titanium provides an excellent balance of form and function. Stainless steel: Steel is the most common choice of flashlight material. It has a high resistance to corrosion. Stainless steel is harder and denser compared to aluminum. Iron headed flashlights provide an extra impact resistance. Copper and brass: These two are good conductors of heat. They are resistant to corrosion. This feature gives them a long-term attraction. 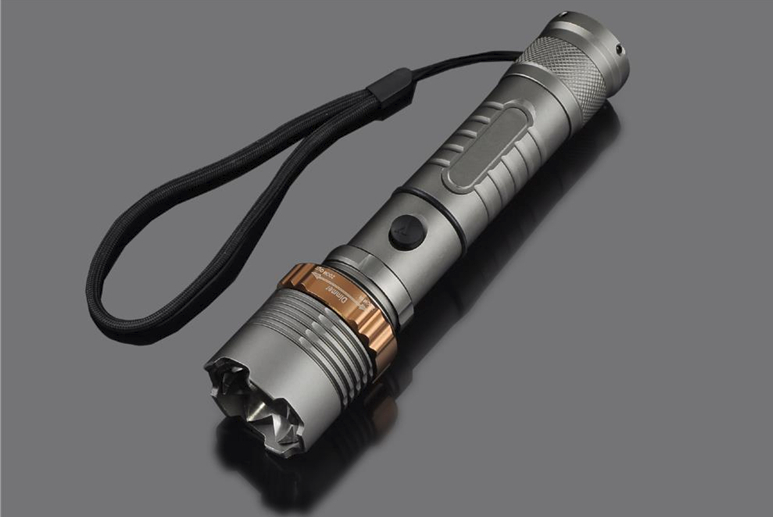 Aluminum bodied flashlights vary in shape. Some are thin and light. Others are thick and tough. The most popular forms comprise of cylindrical shapes. This type tends to roll around anytime they are laid on a surface. However, some of the designs are modified to resist this issue of moving by a knurled pattern design on their bodies. Most users prefer carrying a flashlight by the clip. This method is always interchangeable, that is, you can attach it somewhere on your body facing head up or head down. You may also opt to screw your flashlight facing directly towards the light’s gear. You may attach lanyard straps on small flashlights which mostly have holes at the tail. This formula is convenient for carrying them around your neck. Some flashlights come with holsters. Their function relates to clips. This feature enables the user to attach the gadget to the bag using Velcro straps or D-straps. The hostler can be put in the pocket or around the ankle. When the torch is not in use, holsters provide protection as well. These are accessories that change the illumination from a flashlight for our usage. If you have a flashlight which can convert into a black light, you can opt for the UV filters to hunt down pet stains. I hope you have now understood and appreciated flashlights more than before. You may now decide to find the right choice for your trip. There is a diversity of torches out there on the market for you to make a decision. Hopefully, by embracing the features and functions you require, you will find an excellent type to add to your collection.